Phantom Cardboard: Feed Me Under The Boards! I started watching The Cable Guy a couple weeks ago and was reminded of the hilarious pick-up game. It's easily one of the movie's best scenes. I've always loved this scene, especially when "Chip Douglas" references my favorite show, The White Shadow, when taunting his opponent. For the card I chose my old trusty 1987-88 Fleer basketball inspired design. I actually did look into the various card designs from 1996, the year The Cable Guy was released. The trend in 1996 was for really high definition photography that bled to the edges of the card like a photograph and not much in the way of a border or frame. So, 1987-88 got the nod. I liked the fact that I could prominently feature "Steven's Team" on the card. 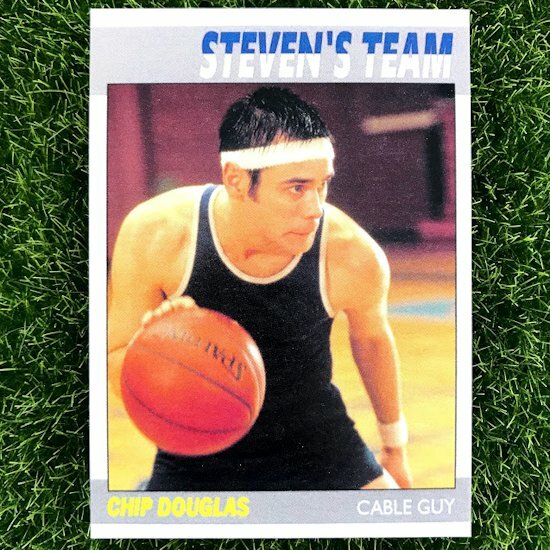 That of course comes from when Jack Black's character tells "Chip Douglas he's subbing in on his team and "Chip" rebuffs with "no way, I'm on Steven's team". And, I was sure to use the white/blue combination for "Steven's Team" matching Carrey's ultra generic basketball uniform.